The IMPACT IMPROVER is your INDOOR SOLUTION to finding the SWEET SPOT. With every swing, you know your point of contact. You get INSTANT FEEDBACK, instant FUN, and a BETTER GAME! The Impact Improver also SAVES TIME, MONEY, and allows you to practice in the comfort of your own home. The Impact Improver is reusable, there is not sticky impact tape residue to deal with. And the Impact Improver fits on YOUR club. Great for beginners and avid tournament golfers. Each Impact Improver includes lots of strikes, lots of learning, and lots of fun! When YOU get the URGE TO SWING, we give you a WAY TO CONNECT! The impact golf ball sticks to the strike-shield for immediate feedback so you can impress your playing partners with improved ball striking on the golf course. Now you can safely practice the game you love indoors with full swings, quick setup, and ease of use. Improve your body and club movement in the comfort of your own home during the winter months. Fits most right handed adult & junior clubs. Will fit some clubs with thick top lines. Be confident with the gift you give this holiday season. 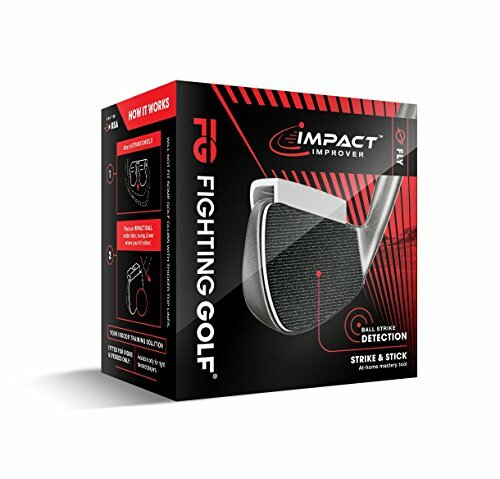 The Impact Improver's modern packaging, includes an Uber Cool Zipper Storage Carrying Case, 3 Impact golf balls, the StrikeShield, and the Facilitator tool! Used by both PGA and LPGA Teaching Professionals. PINNACLE AWARD WINNER at the 2018 PGA SHOW for BEST NEW PRODUCT!!! DEVELOP A BETTER SWING WITH INSTANT FEEDBACK. The provided impact balls stick to the Strike Shield so you know your point of contact. TIME SAVER - PRACTICE ANYTIME AND ANYWHERE! Don't let life or the weather get in the way of your golf swing. RANGE PRACTICE ENHANCED. Maintain your feels and timing because you can swing on a regular basis. Helps you focus 100% on body and club movement for better performance since ball flight does not distract you. FUN AND EASY TO USE YEAR ROUND. No assembly. Safely practice indoors because the ball is lightweight and sticks to the Strike Shield. GREAT GIFT, FITS MOST IRONS. Fits 90% of junior and adult irons.Won't fit some clubs with thicker top lines. Fits only Right Handed clubs. | 2018 PGA MERCHANDISE SHOW PINNACLE AWARD WINNER FOR BEST NEW PRODUCT!!! If you have any questions about this product by Fighting Golf, contact us by completing and submitting the form below. If you are looking for a specif part number, please include it with your message.